We know that a helicopter tour in Hawaii is a once-in-a-lifetime experience and many say it’s the highlight of their vacation. There’s no better way to see Hawaii’s remote and beautiful treasures than from a helicopter. It’s an indescribable thrill to lift off the ground at an airport and a few minutes later be soaring over secluded beaches, deep meandering valleys, cascading waterfalls, and of course… the steaming plumes of an active volcano! 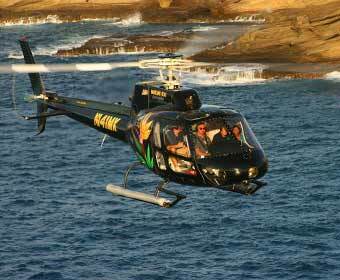 Hawaii Helicopter Tours is where you can learn more about the scenic highlights and various tour routes offered. We invite you to discover the various geographic regions of the Islands of Hawaii so that you can be sure to pick the flight that’s right for you. Enjoy your exploration of paradise! If you have any questions, please send email to info@hawaiihelicoptertours.com – we’re here to help! We recommend booking your Hawaii Activities before you arrive in Hawaii. Your tickets to authentic tropical luaus, round-the-island tours, skin diving, and unique Hawaiian adventures can all be reserved online. You’ll be sure to get tickets on the day you want and you’ll likely save money too! Pearl Harbor Tours - CLICK HERE! Hawaii Luaus - A guide for Visitors Top Maui Activities - CLICK HERE!